In Ultimate Chicago, Pentrex takes you on a whirlwind tour of what might be the greatest place in America to see railroad action at its finest. 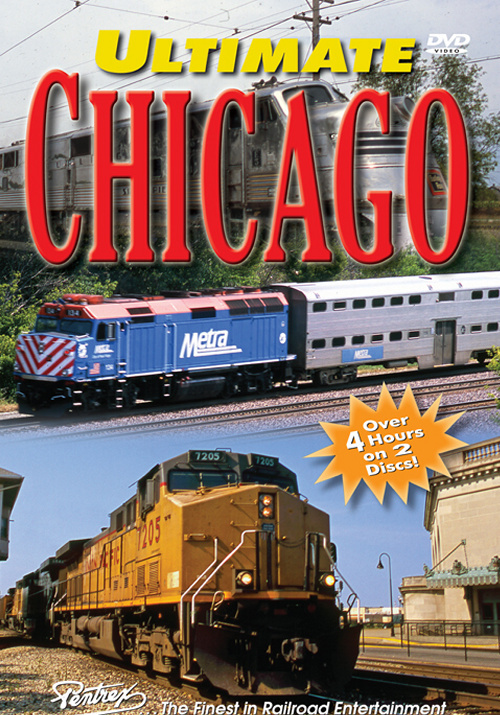 Making stops all around the Chicago area, including Northeast Illinois, Northwest Indiana and Duplainville, WI, you'll enjoy trains and more trains, including a 1912 Heisler on Silver Creek & Stephenson and diesels from five different builders, such as EMD, NRE, GE, FM and ALCO. You'll see action from BNSF, UP, METRA, CN, CP, IHB, IAIS, CSXT, AMTK, NS, WSOR, and a whole lot more, including survivors from EJ&E, IC&E and WC. Here's your opportunity to see the best trains in some of the best spots anywhere! Award Value: 149 Points Earn points for free DVDs. Signup free. Hugh Definition (Lake Elsinore, Ca) on 2015-07-19 08:47:51. I thought this was a GREAT video. Whenever I visit the Chicago area, I often find myself in many of the areas that are on this program! What a great variety of things and locations to see. I thought the color was fantastic and the narration was great as well as very informative. Not sure I understand what the others were complaining about. People seem to complain about "too much narration" while others complain about "not enough narration" for the same show. Gotta take that with a grain of salt. I think the entertainment factor for this show is VERY HIGH!!! rrvideojunkie (usa) on 2014-07-02 16:25:19. The video had a lot of variety but it wasn't done well enough by Pentrex standards. There was too much narration. The narration often continued while the locomotives passed drowning out the sounds of the trains. This is not standard practice for Pentrex. They are usually good at letting the trains speak for themselves. Pentrex doesn't seem to be as good as they once were. On their website they advertise "new videos", but they are actually old videos made for dvd. I don't know why they never made a video of the Acela Express which is a big story in American railroading. They need to get their act together. run8anderson (Basking Ridge, NJ) on 2014-07-01 13:29:18. Sorry Pentrex. ...you're losing it!!! Their videographers must NOT be railfans. Three examples: 1 - On several occasions just as a train is about to pass a green signal, the view of the train changes so you miss the red signal change (am I picky?) 2 - The same happens as the lead locos are about to pass from one track to another through a turnout...you don't see them progressing through the switches. 3 - And this really bothers me. As an interesting load of I think military vehicles on a flatcar are approaching. ...do we get to see a close up. NO!! Now with the endless scenes of stack and oil trains, this would have been a pleasant change. I will give credit to Pentrex for great research and narration, although some of the scenes are really outside of Chicago. This is a so so production from Pentrex. First the picture quality is nothing special. Pentrex please offer a blu-ray choice! Second, the use of maps are terrible. They show a junction map a third grader could draw with no relation to where we are in the world. They do show a map of where cities are in relation to Chicago but not until 52minutes into the second disc! The title is another joke. This should be called the Ultimate Mid West. They only show the city of Chicago maybe 2 times. I think the Ill. Railway Museum was the best part of the entire video. I think Pentrex is anti Blue Ray. I've looked on their web site and can't find a single one, not even in their newest releases. And, thanks to all the reviewers. I was intending to get this but now I won't. Mokena RR (Mesa Az) on 2014-04-25 14:52:57. I have many Pentex videos , so I was expecting the normal super quality that is the norm with them, WRONG. The quality of the video is not all that good , not sharp at all and the color is dull. It kinda looks like an old VHS quality that was converted to DVD. Too bad.